The heroics of Dragon Warrior Po Ping continue in an eye-popping animated riot of texture and colour. Pity that the script is more humdrum, if pleasant enough for tykes and adults who enjoy time-honoured family film sentiments of love, community and Taoist life wisdom. But since these are served up with frantic action sequences, sight gags, super-cute baby pandas and a stonking voice cast, what’s not to like? 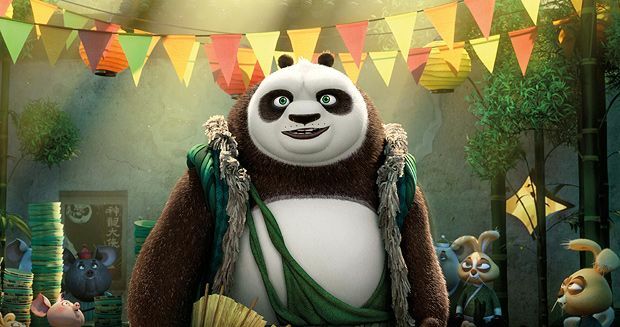 This time out Po (voiced once again by Jack Black, who’s inexhaustibly loveable) is nonplussed to be promoted by retiring Master Shifu (Dustin Hoffman) to the status of teacher-trainer, a development that makes him insecure and more clueless than usual. Simultaneously, dastardly demon water buffalo Kai (JK Simmons!) escapes the spirit world and starts stealing the chi of every kung fu master in China, turning them into an army of zombie jade warriors. By happy coincidence legend has it that the key to stopping him is to be found in the lost village of pandas, and Po is reunited with his lookalike biological father Li Chan (Bryan Cranston! ), who can take him there. Po is caught in a good-humoured and really quite touching tug-of-love between papa panda and adoptive father goose Mr Ping (James Hong), as he trains the village of cuddlesome pandas into roly-poly warriors and discovers who he really, really is.